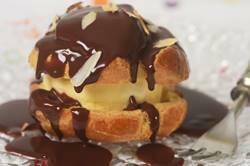 There are so many desserts that you can make with choux pastry. One of my favorites is these Profiteroles (pronounced pruh-FIHT-uh-rohl). For this Profiterole recipe we start with crisp, hollow rounds of choux pastry that are split in half and filled with vanilla ice cream. Then you pour a warm chocolate sauce over the top. The combination of pastry, a warm chocolate sauce, and icy cold vanilla ice cream is wonderful. The word 'Profiteroles' is believed to be derived from 'profit', which means 'small gift' which seems like a fitting name for such a delicious dessert. No matter if you are making these Profiteroles or Cream Puffs, they both start with a baked puffed shell of choux pastry. Choux pastry is an unusual pastry in that it is first cooked and then baked. It starts with a mixture of butter and milk/water (like a roux). Flour is added and then this mixture is cooked until it forms a smooth ball of dough. After cooling the dough to lukewarm, eggs are slowly added and the dough is beaten until it becomes a smooth thick sticky paste. This paste can be piped or spooned onto a baking sheet, and then the choux is baked. It is baked, first at a high temperature, and then at a slightly lower temperature. The high temperature is needed so the dough will rise quickly (leaving a hollow center) and to set the structure of the shells. The temperature is then reduced to allow the outsides of the shells to become firm, while at the same time allowing the insides of the pastry to dry out. Once the pastry shells have cooled, they are split them in half and, for this recipe, we are filling them with vanilla ice cream (homemade or store bought). Fill with enough ice cream so that when you place the top half of the choux pastry on it, you can see the ice cream peeking out the sides. The finishing touch is a drizzling of warm chocolate sauce. I'm using Chocolate Ganache, which is a mixture of semi sweet or bittersweet chocolate and heavy cream. It is simple to make and I love its rich chocolately flavor. Choux Pastry: Preheat your oven to 375 degrees F (190 degrees C) and place the oven rack in the center of the oven. Line a baking sheet with parchment paper or you can lightly butter or spray the pan with a non stick vegetable spray. In a bowl, sift or whisk the flour. Put the butter, sugar, salt, water, and milk in a heavy saucepan. Place over medium high heat and bring to a boil. (Make sure that the butter melts before the water boils to reduce the amount of evaporation.) Remove from heat and, with a wooden spoon or heatproof spatula, add the flour, all at once, and stir until combined. Return the saucepan to the heat and, stirring constantly, cook over low heat until the dough comes away from the sides of the pan and forms a thick smooth ball of dough (about one minute). Transfer the dough to your electric stand mixer, fitted with the paddle attachment (or use a hand mixer or wooden spoon), and beat on low speed to release the steam from the dough (about a minute). Once the dough is lukewarm add about 3/4 of the lightly beaten eggs (dough will separate and then come together) and continue to mix, on low speed, until you have a smooth thick paste (dough will fall from a spoon in a non-ragged "V" shape). (See video for demonstration.) Add more beaten egg, if necessary, until you get the correct consistency. Spoon or pipe (or use an ice cream scoop) 8 mounds of dough (a scant 3 tablespoons (40 grams)) onto the baking sheet, spacing about 2 inches (5 cm) apart. With a pastry brush, gently brush the tops and sides of the dough with a lightly beaten egg. Bake for 10 minutes and then reduce the oven temperature to 350 degrees F (180 degrees C). Bake for a further 25 to 30 minutes or until the shells are golden brown and when split, are dry inside. Remove from oven and place the baking pan of a wire rack. Cool the choux pastry completely before filling. Assemble: Split the pastry shells in half, fill the bottom halves of the shells with a scoop of ice cream, and replace the top. Drizzle each Profiterole liberally with warm Chocolate Ganache. Serve immediately. Note: Truffles can be made with any leftover Ganache. Truffles are just small balls of chocolate that can be rolled in cocoa powder, powdered sugar, or toasted chopped nuts. Make sure the chocolate ganache is well chilled before forming into balls. You can use your hands to form the truffles, or else a melon baller or small spoon. Truffles can be refrigerated for a couple of weeks or else frozen for a couple of months.